You'll think you're actually on a movie set when you star in the cinematic action/adventure Out Of This World?.Out Of This World? 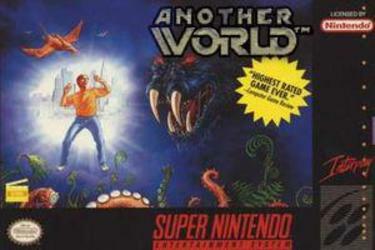 is like no other game on the Super NES?. Using a completely new graphic system of cinematic zooms, pans, close-ups, and cuts, Out Of This World? gets you involved in a breathtaking story of inter-dimensional travel.You'll duck as lasers blast, boulders crash, and monsters roar. The complete musical score and realistic, digitized sound effects will make you feel like you're on a movie sound stage.Being a hero is hard work, and you'll experience it first-hand as you run, jump, dodge, and shoot your way across a hostile world of deadly earthquakes and alien monsters. So, grab your hat and whip, charge up your blasters, and get ready to star in your own movie that'll take you Out Of This World? !